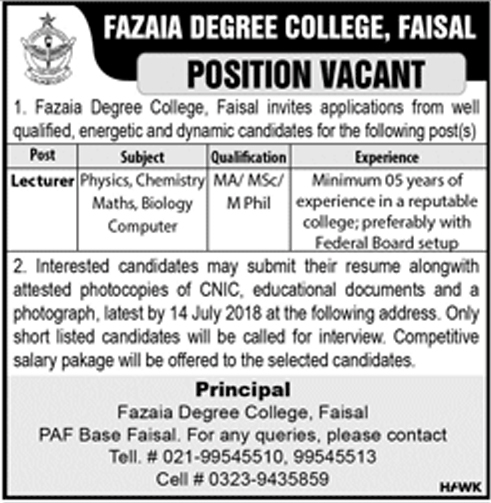 Fazaia Degree College Faisal Karachi Sindh. MA/ MSc/M.Phil. Minimum 05 years of experience in a reputable college preferably with Federal Board setup. Interested candidates may submit their resume along with attested photocopies of CNIC, educational documents and a photograph. latest by 14 July 2018 at the following address Only shoe listed candidates will be called for interview Competitive salary package Al be offered to the selected candidates Principal Fazaia Degree College, Faisal PAF Base Faisal, Karachi.